Have wallpapers in your collection slowly pan and zoom across the desktop with these cool effects. 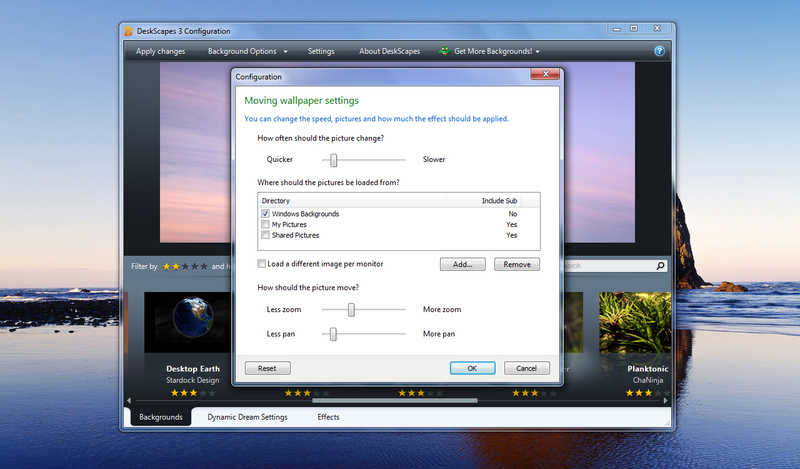 Choose folders of wallpapers to use, and several adjustment settings are included to customize the .dream. *DeskScapes 3.5 or higher required. Windows 7/Vista required. How do you purchase these dreams when i click on buy now it takes me to a page where it says there is no items in my cart. has anybody tried to buy one of these new dreams? I end at stardock side "no items in your basket". The issue with the cart should be resolved, please try again. This appears to be similar to "Photo Dream", Neil. Are there any differences? This one supports png images as well as bmp and jpg images. It supports different images per monitor unlike the photo dream and the effect is a slow pan and zoom in effect while the photo dream is a moving in 3D space dream, though there is the option for that to work in a more 2D manner. The two basically share a UI design though including the folder handling code. Very Nice, doesnt compair to the Collage one though I liked that one also. Please!!! Serial number for this dream???? This is a nice theme. You are providing very unique things here.